Last week, five repeats of “The Tonight Show” bested five originals of “Jimmy Kimmel Live!” To make matters worse — or at least, more dramatic — those new ABC episodes all took place in Brooklyn instead of Los Angeles, marking a ratings stunt of sorts for the travel-happy Jimmy Kimmel in Fallon’s backyard. The road trip didn’t quite work out that well for ABC, though its show did hit seven-month highs in both the key demo and among total viewers. That said, like Fallon, CBS competition Stephen Colbert was also in reruns last week. And those seven-month-ago figures? Those were from Kimmel’s last road trip, which was in Austin, Texas, for South by Southwest. Fallon’s “Tonight” reruns pulled a 0.88 rating in the key 18-49 demographic, along with a 4 share and 3.22 million total viewers, on average. 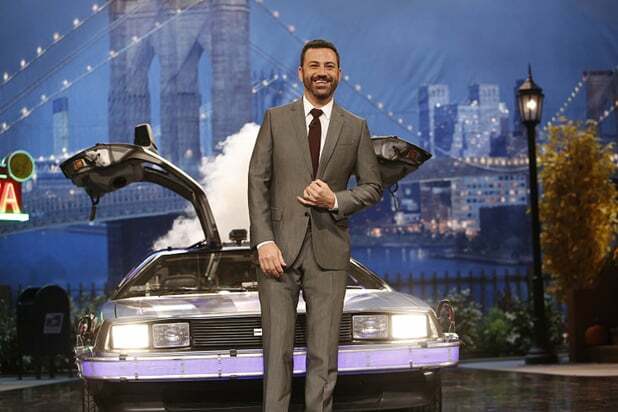 “JKL” received a 0.67/3 and 2.776 million viewers. “Late Show” reruns got a 0.57/3 and 2.3 million viewers. It’s worth pointing out that Thursday’s CBS encore was delayed by an NFL football overrun. There was one definite highlight for ABC’s 11:35 p.m. offering: With guests Michael J. Fox and Democratic Presidential candidate Bernie Sanders, Kimmel scored his strongest Wednesday telecast (pictured above) in almost a year per both main metrics. Cuoco and Fallon answered random trivia questions and receive a puppy for every one they get right. Rudd is forced to drink cold gravy in this drinking-game incarnation of "Plinko." Union joins Fallon in a skit surrounding the hilariously sung morning new, to the music of Rihanna, The Weeknd and Walk the Moon. Things get a little crowded as Shaq and Jackman face off in this trivia game, which involves squeezing a lot of people into a small space. Wahlberg faces off with Fallon to shoot random objects -- popcorn, feathers and even an Eiffel Tower -- off each other's heads. Cruise and Fallon recreate his "Top Gun" serenade of “You’ve Lost That Loving Feeling” in an epic Lip Sync duet. Gordon-Levitt and Fallon lead the Ragtime Gals in a unique performance of Rihanna's angry hit. The Oscar-winning actress destroys Fallon in this classic "Tonight Show" game. Reynolds and Fallon play Blackjack with a twist -- winner of each round gets to slap the other with a gigantic foam hand. Timberlake and Fallon cover classic hip-hop hits from past to present in this popular six-part skit. Paltrow also shows off her hip-hop skills by singing Nicki Minaj and Big Sean hits in a Broadway style. Fallon recreates Richie's iconic music video, but crafting a clay bust of the singer using his real head. Willis dons a toupée to channel his inner Trump.